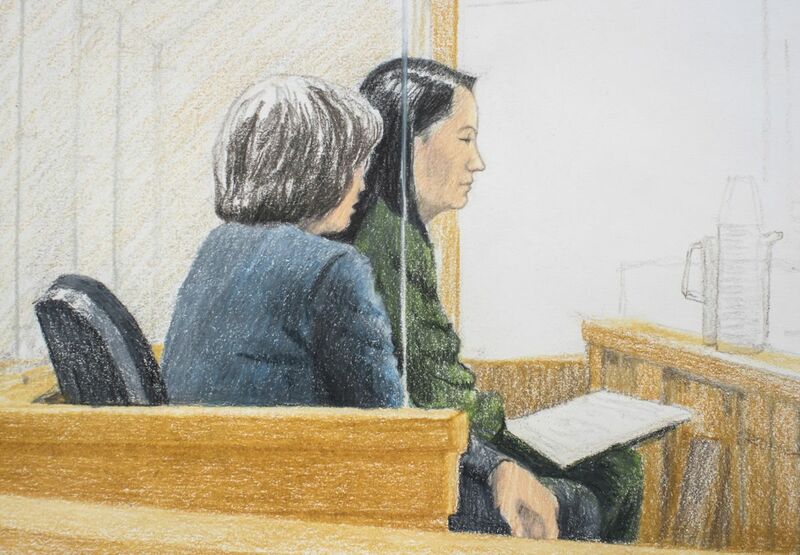 VANCOUVER, British Columbia — A top Chinese telecommunications executive facing possible extradition to the United States appeared in court Friday as she sought bail in a case that has rattled markets and raised doubts about the U.S. being able to reach a truce in its trade war with China. A prosecutor for the Canadian government urged the court not to grant bail, saying the charges against Meng Wanzhou, the chief financial officer for Chinese telecom giant Huawei, involve U.S. allegations that Huawei used a shell company to access the Iran market in dealings that contravene U.S. sanctions. Prosecutor John Gibb-Carsley said Meng, who has vast financial resources as the daughter of Huawei's founder, has incentive to flee Canada because she faces fraud charges in the U.S. that could bring up to 30 years in prison. The prosecutor said Meng assured U.S. banks that Huawei and the shell company alleged to have done business with Iran, called Skycom, were separate companies, but in fact Skycom and Huawei were one and the same. "Ms. Meng personally represented to those banks that Skycom and Huawei were separate, when in fact they were not separate," Gibb-Carsley said. "Skycom was Huawei." Meng has contended Huawei sold Skycom in 2009. Gibb-Carsley said the warrant for Meng's arrest was issued in New York on Aug. 22. He said Meng was aware of the U.S. investigation and had avoided the U.S. since March 2017, even though her teenage son goes to school in Boston. Meng was arrested in Vancouver on Saturday en route to Mexico from Hong Kong. Meng's lawyer, David Martin, disputed the prosecutor's call to deny bail, saying: "The fact a person has worked hard and has extraordinary resources cannot be a factor that would exclude them from bail." He said Meng's own personal integrity would not allow her to go against a court order, and that she would not embarrass her father, company founder Ren Zhengfei , by breaching such an order. He said Meng had agreed to wear an ankle monitor. The case is the latest development in a surprising legal wrangle that raises doubts about whether a U.S.-China trade cease-fire can hold. Trump himself sought to inject a note of optimism into the proceedings, going on Twitter before dawn Friday to say: "China talks are going very well!" "It's a much broader issue than just a trade dispute," said Amanda DeBusk, chair of international trade practice at Dechert LLP. "It pulls in: Who is going to be the world leader essentially. ... It's a Cold War situation." Meng was detained on the same day that Trump and Xi met at the Group of 20 summit in Argentina and agreed to a cease-fire in their trade war. White House economic adviser Larry Kudlow said Friday on Fox Business Network's "Varney & Co" that Huawei had violated U.S sanctions on Iran. "They had been warned, and finally we had to prosecute that," he said. Huawei is the world's biggest supplier of network gear used by phone and internet companies and long has been seen as a front for spying by the Chinese military or security services. Still, attorney DeBusk said, "I would certainly expect the Chinese to do something in retaliation" for Meng's arrest, perhaps by targeting U.S. companies doing business in China. "Let's see who doesn't get a permit or which U.S. executive gets arrested," she said. The world's two largest economies are locked in a dispute over charges by Washington, echoed by U.S. industry groups and analysts, that China has deployed predatory tactics in its drive to overtake America's dominance in technology and global economic leadership. These allegedly include forcing American and other foreign companies to hand over trade secrets in exchange for access to the Chinese market and engaging in cyber theft.